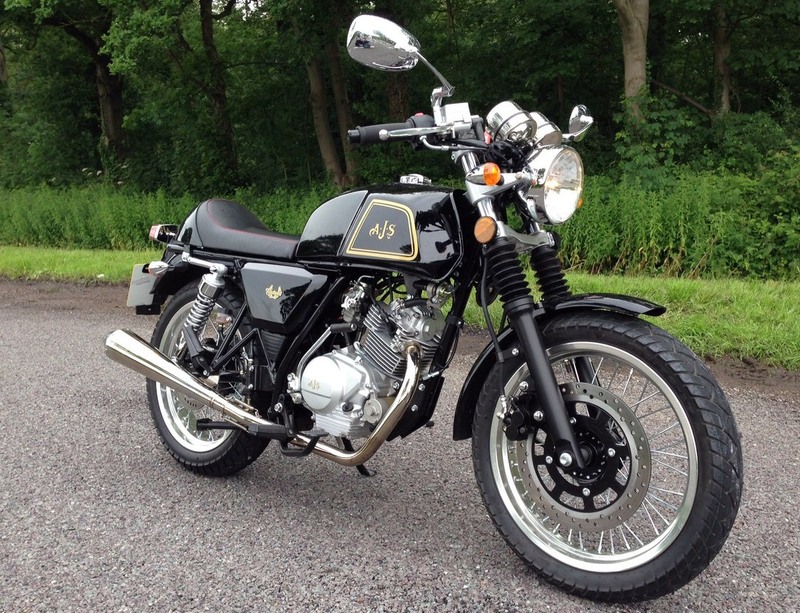 Real Riders: AJS Cadwell 125 Review, The Fun Factor! 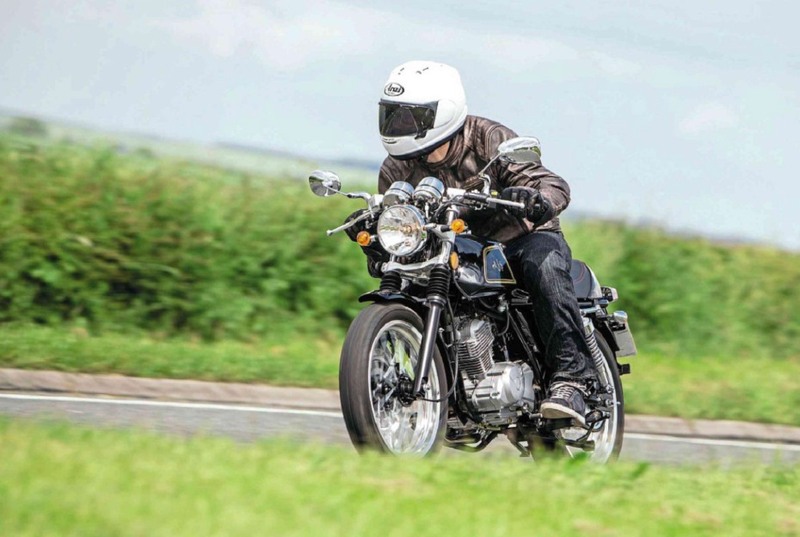 AJS Cadwell 125 Review, The Fun Factor! 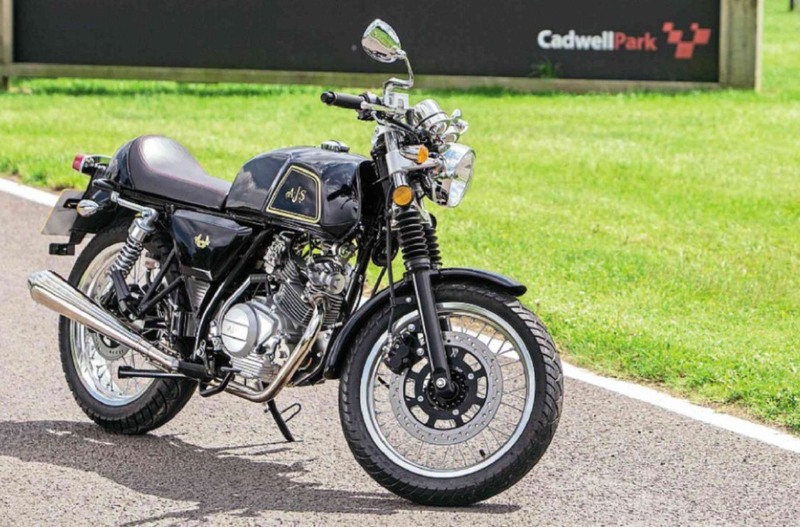 The AJS Cadwell 125 combines three things that are red-hot popular at the moment: classic café racer looks, British motoring heritage and Chinese engineering (and let’s be honest, the pricing that comes with the latter). This is an exciting bike for anyone on an A1 licence, looking for a trendy city bike with enough poke to take on the odd country road too. Among all the café racers currently rolling out of various factories, the AJS Cadwell 125 stands out as a particularly good-looking option. The bike is available in black or silver, with AJS and Cadwell logos tastefully added to the tank and covers. The AJS Cadwell 125 overall impression is of understated style, from the Monza-type fuel cap to the sculpted single seat. The bullet indicators, spoked wheels, straight stainless-steel exhaust, rubber fork covers and clip-on handlebars all add to the timeless classic look. The clocks are equally simple and effective, featuring only the speedo, tacho and odometer. The lights for indicators, full beam, neutral and low fuel look good, but are not bright enough to stand out properly from the dash. Brighter bulbs behind them would have added to the ease of use. The switchgear is basic but of good quality and the buttons and switches are all easy enough to operate. You just have to remember to switch off the manual choke once the engine is warm. There’s an electric start as well as kick-start, and both work well. The air-cooled, single-cylinder, four-stroke, 125cc engine has been manufactured by Jianshe (Yamaha’s partner in China). There’s enough grunt to get the AJS Cadwell 125 up to speed pretty swiftly, and cruising at 50-60mph is no problem. The engine is well capable of keeping up to speed with traffic in the city and even on the occasional country road. The AJS Cadwell 125's engine sound is pleasant, including the odd bang from the exhaust when you roll on and off the throttle. I enjoyed the sound so much that I went on and off the gas far more than necessary, just to hear it popping. Although the engine is modern, it fits the retro looks due to the air-cooling and the use of a carburettor instead of fuel injection. The exhaust also runs directly from the cylinder to the end can without a cat box in the way. 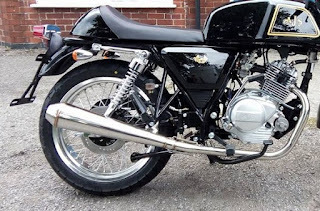 These may be slightly outdated designs in an age where many new bikes enjoy liquid-cooling, fuel injection and advanced systems for emissions control, but on AJS Cadwell 125 they look the part. 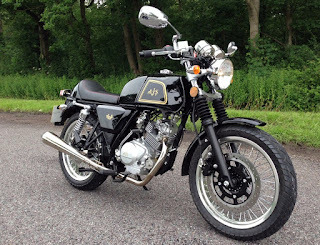 AJS Cadwell 125 - On The Road! The AJS Cadwell 125 riding position is slightly on the sporty side of neutral with the low handlebars inviting you to lean over the tank as the speed increases. This doesn’t mean that you can’t sit up quite straight in town traffic though. As the bike is very low, it’s easy to get both feet firmly on the floor. The seat is on the hard side, but not uncomfortable. Interestingly the standard set-up includes a single seat, but there are pillion footpegs. AJS Cadwell 125 offers a different seat option which enables carrying a passenger, so the option is there should you want to swap the cool looks of the seat cowl to a pillion space. The brakes aren’t ABS, but they work well. The front brake, with a single disc and a two-piston caliper, is particularly good. The rear brake, with a single-piston caliper, also works without a hitch, but the brake pedal lacks a bit of feel for it to be entirely reassuring from the start. The five-speed gearbox is smooth and accurate, with the gears slotting in place nicely whether you’re switching up or down. Even at 60mph, the AJS Cadwell 125 feels quite stable for a small machine, and it drops into corners very easily. Steering needs to be kept steady at high speeds as sudden stabs at the bars will translate into wobbles quite quickly; however, for a 125cc bike, this one handles speed admirably. If you have an A1 licence and you lust after a café racer you could do a lot worse than take an AJS Cadwell 125 out for a test. The bike has a lot going for it from the looks to the engine and the general fun factor.